The bond between animals and humans is one of the most beautiful bonds time has seen. Besides giving love and a lifelong friendship, animals have proved beneficial for their owner’s health. AARP.com tells us that human and animal interaction releases a hormone called oxytocin in the central nervous system that causes a feeling of happiness and reinforces a bond. Animals also have a healing effect for their owners, and their owners for them. Karen Grindler who runs Cedar Creek Therapeutic Riding Center in Columbia, Missouri says horseback riders with disabilities receive massive mood improvements through riding horses. Research on the animal and human bond has been conducted, but it’s surprising when you think about how big a part of people's lives these companions are, says Dr. James Serpell, Ph.D., director of the Center for the Interaction of Animals and Society at the University of Pennsylvania's School of Veterinary Medicine. If you’re thinking about adding a new member to the family there are several important aspects to consider; looking at the tips below and considering your personal situation, you will hopefully be able to further your decision about which pet is best for you or the family! A time commitment is required when getting a puppy. Puppies need constant attention, in addition to training, exercise and your patience. Dogs, as well as puppies need exercise and attention so time must be made for that each day. Kittens, like puppies need attention but are much more independent so they do not need as much. When cats want attention they come to you, otherwise are fairly free animals that don’t require as much time out of your day. Another factor is time to clean the litter box, this should be done daily. Because puppies need exercise it is nice to have a yard, an apartment is okay too, but better for smaller dogs. If you live in an apartment you will have to take the dog out to go to the bathroom as well as exercise. The size of the dog and it’s sleeping area in your home will make a difference in that decision too. Kittens are suitable for any space, the main thing to consider is furniture damage and litter box placement in your home. Can you afford to let a cat roam your entire home, or would it need to be kept out of certain spaces? Puppies often cost more because they are bigger which means they need more food, basic veterinary care is usually more expensive for dogs than cats and when going on a vacation a dog may require a pet sitter or pet hotel which can add up. Pups may need to be taken to training school which costs money per session or per class. Kittens need more materials than dogs because they need litter, a litter box and food. This needs to be purchased close to biweekly. If you go on vacation cats can pretty much care for themselves. They would most likely just need extra food and water depending on how long you are absent. Toys, treats, beds and other accessories can be purchased at your discretion. Most puppies and dogs are awesome with kids! Kids also like, and can learn, responsibility when taking care of a puppy or dog. Dogs also serve as protectors for a family. Active kids and active dogs are a great combo! Kittens may be great for kids but when it grows it may not be as playful, only when it wants to, not when the kids want do. A cat does not always actively engage and give attention like a dog more often does. Puppies require cleaning up after when they go to the bathroom. Pups and dogs also require bathing and brushing. Dogs also bark and will need to be given attention or resolve when this happens. Training a pup takes a lot of time and patience but can also be fun and allows you to spend time with it. Kittens and cats are self-cleaning and brushing is optional. Their litter box does need more attention then a dog going in the backyard would. Cats love scratching and need to be declawed or have their claws clipped often. Both animals shed, although certain types of short-haired dogs may shed way less than a cat. Puppies or kittens can be a great comrade or a new best friend. If the family isn’t quite ready to add a new member yet there are lots of puppies and kittens at the humane society that need love and attention. When looking into getting a new pet don’t overlook the humane society. The humane society is always getting new animals that need homes. 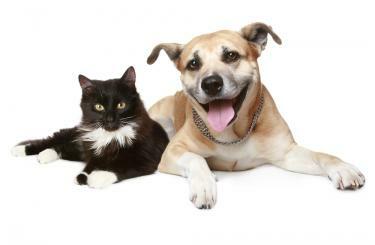 Consider a full grown cat or dog that is already trained and needs a home!